Florida is famous for its alligator population, and Gatorland in Orlando is a good place to experience these interesting animals. The park is home to thousands of alligators and crocodiles, with a breeding marsh with boardwalk and observation tower, reptile shows, an aviary, petting zoo, swamp walk, and educational programs. A huge thrill is provided by the Gator Zip Line, which allows brave visitors to the park to zoom about high above the enclosures. 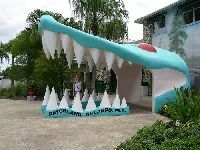 Gatorland has several restaurants and even offers a gluten-free menu. Visitors can enjoy the whole park at a leisurely pace in about four hours, but a family can easily spend longer time enjoying the various attractions. Address: 14501 S Orange Blossom Trail.